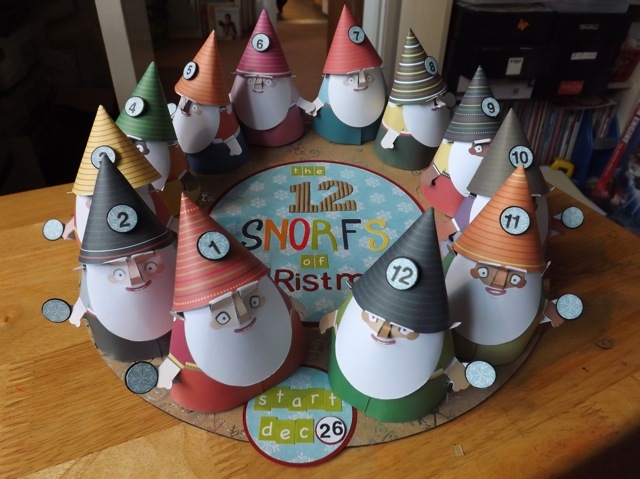 12 Snorfs of Christmas – finished! DONE! 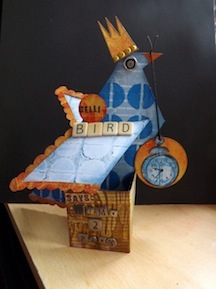 Quite pleased with it and I think it will be a bit of fun for the holidays. 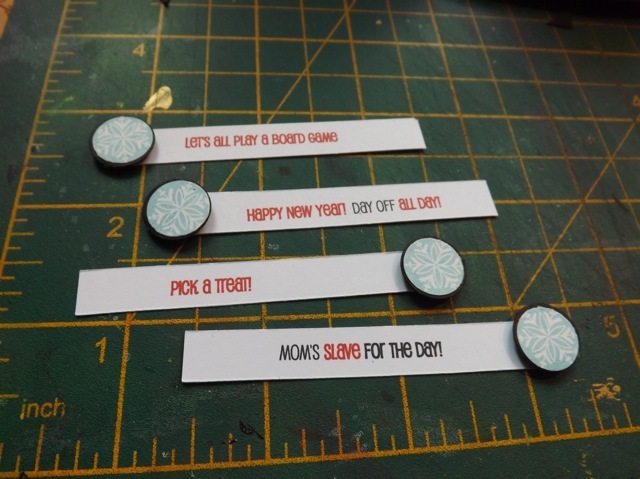 The advent Calendar is all about the treats, or at least every one I’ve ever made is, but this 12 Days countdown is more about two things: getting the kids to do the after-Christmas tasks they are not exactly keen on, and planning for some family time. I don’t know about you but we are SO busy over the holidays that it’s all too easy to just all go off in our own direction. 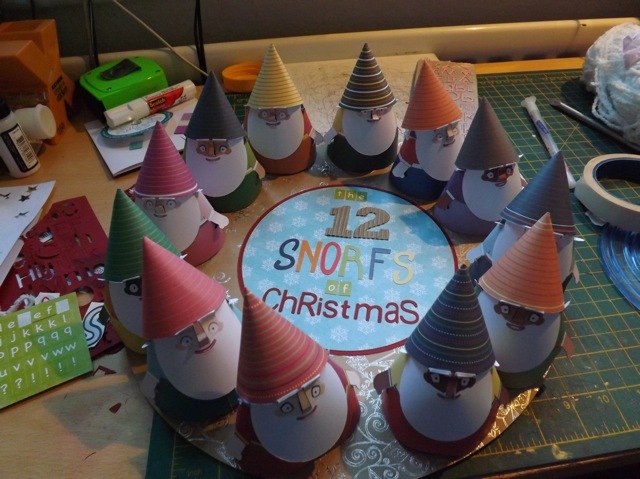 As I’ve mentioned, some of the Snorf tasks are fun stuff (watch a family film together, or play a board game) and some are must-do’s (help store the boxes, or write your thank-you notes) and some are a mix (help take down the tree – with Hot Chocolate!) but they are all either planned family time or required tasks. 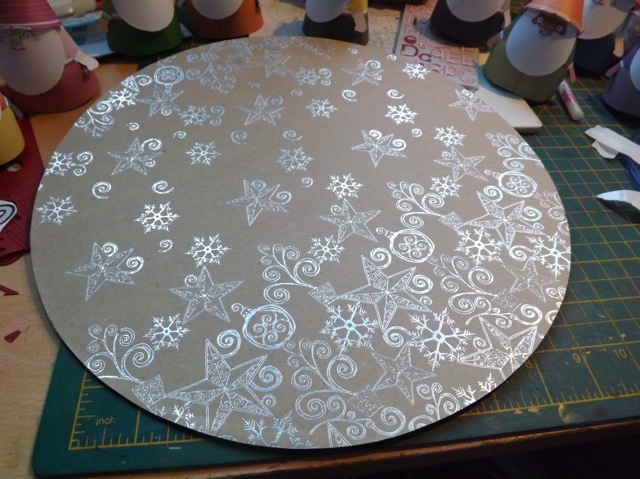 Once I printed, cut and folded all 12 3eyedbear Snorfs (and there are 15 of them so you can pick your favourites) I cut a 12″ circle from matboard and covered it with the last bit of the starry wrapping paper. 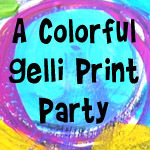 Love the silver on kraft, and as the Snorfs themselves are super-colourful I didn’t want to add too much more. You can now attach the Snorf to the base – strong double-sided adhesive, hot glue, wet glue, as you prefer. 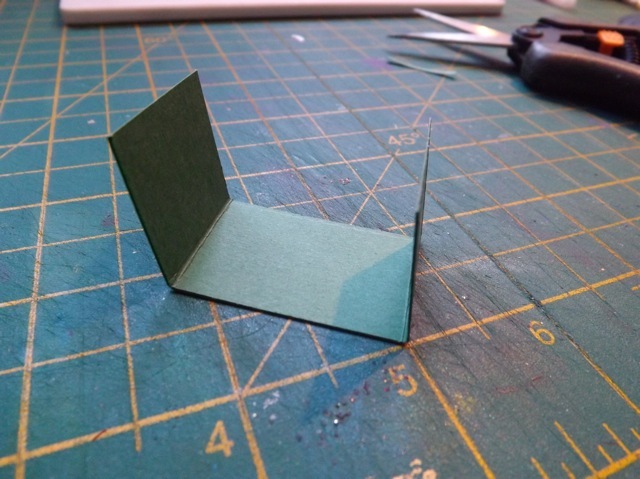 If you are struggling to get a good bond, because it is hard to put enough pressure on the Snorf to make it stick, you can slip something (a rub-on stick worked for me, but a pencil, eraser end, would work too, I think) into the hand cut-out and press from the inside. As you can see I added numbers to their hats. Certain tasks will be the same every year (like the Day Off for New Year’s Day or the taking down the tree day) so numbering them seemed more sensible. I also changed the strips – I made them just about 3/8 inch wide (although up to about 1/2 inch will still slip inside the hand-hole) and swapped the button for the circle on a foam pad. I did six with the circle left and six with it right, although you can do them all one side or the other and slip them in to the hand-hole upside down. Can you see how the circle sort of catches on the hand? I think it looks neater than the strip extending out the 2nd hand-hole, instead in just lays in the cavity and the circle holds it in place. From what I read the 12 days of Christmas can start on either Christmas Day or on Boxing Day. You can pick which you prefer and add that. 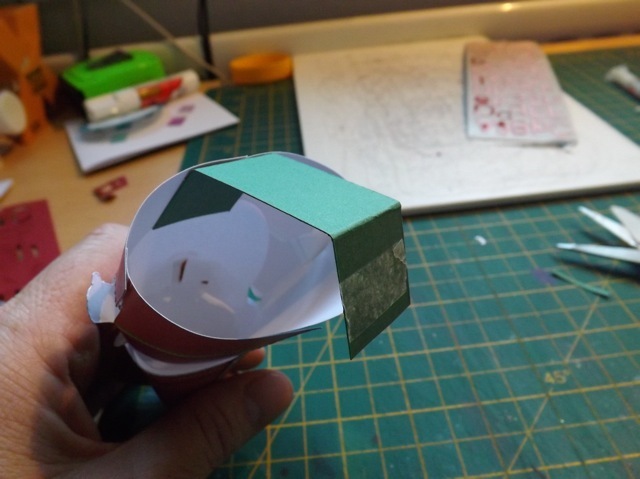 Stick an envelope to the underside of the base to store the strips, and if you add felt circles around the edge of the base (I like to use those chair leg protector pads as they are quite thick, sticky on one side and felt on the other) then the base won’t wobble on the envelope. Now I have a gazillion things to do and crafting at my desk is not one of them! 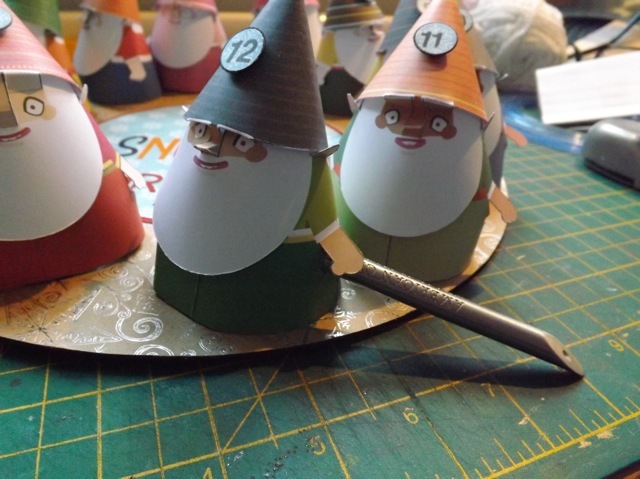 Categories: Christmas, paper sculptures | Tags: calendars, Christmas, how-to | Permalink.